This book is a planetarium! This incredibly cool book uses intricate folding to act as a portable planetarium. It's also a spirograph tool, a portable speaker, a perpetual calendar, decoder ring and guitar - and they're all made from paper. UK pub chain JD Wetherspoons has decided to stop all their social and digital marketing believing it's a waste of their time and only encourages people to complain. All their marketing will now go on their magazine and website only. An environmental agency in Colombia has met a challenge to their native fish species by pairing their marketing campaign with a practical solution: the poster educating fishermen about catching lionfish turns into a net to do just that. Creative binding is trending, but is it right for you? Like everything in print, there are lots of options. But be careful you don't get caught up in the head rush and get quoted for some fancy Japanese stab binding - and the price difference too - when all you need is a simple saddle stitching. Click here for our free Glide Print Guide to Standard Binding. Binding can be formal, handcrafted, traditional, contemporary, industrial - there are plenty of interesting choices. It's as important to a finished project as the concept, design and printing because the way a piece is bound is crucial to a great first impression. We created a handy guide to help you avoid any confusion so you can ask for the binding technique that's best for you. Or just call us. We know all about binding, we've been doing it for over 20 years. As businesses move towards 100% digital transactions, claims such as "save trees, go green and go digital" are part of their marketing strategies to encourage consumers to switch from paper to digital communications. these claims are a form of greenwashing. 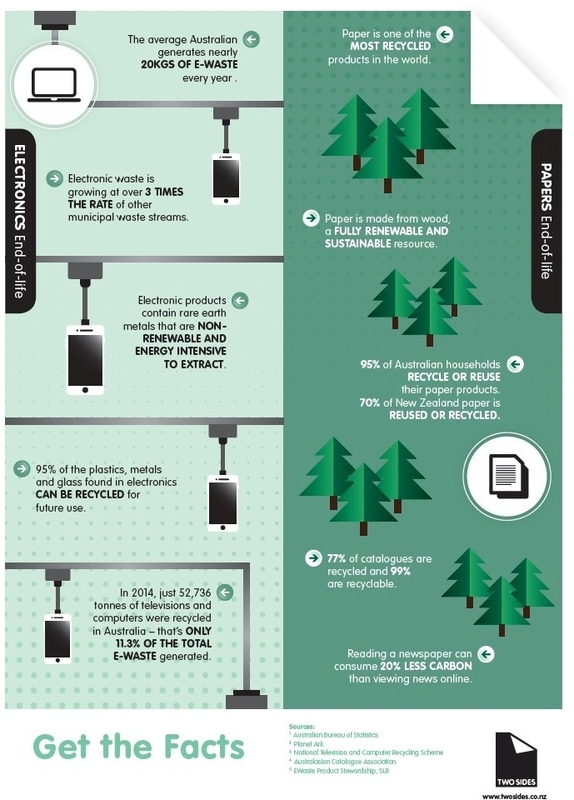 To keep you informed of the facts over the fiction, here's some interesting data about how your electronic communications.are affecting the environment. Click here to download the full-sized image. The Pulp, Paper & Print sector is one of the smallest greenhouse gas (GHG) emitters of the major industry sectors on the planet, responsible for just 1.1% of the world's GHG emissions. Paper made from sustainable forests is needed to start the paper cycle. Recycled fibre degrades after several uses and the paper industry needs fresh fibre from responsibly managed forests to keep the renewable cycle going. 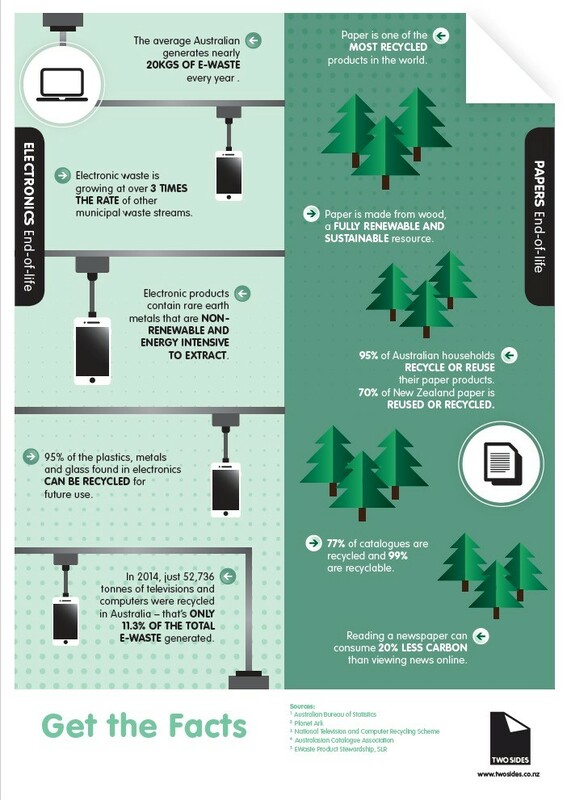 Paper is one of the most recycled products in the world. In fact, 95% of Australian households recycle/reuse their paper products. Paper is recycled more than any other household item. More energy, water and other resources are used in making new things than in recycling. Recycling paper saves 60% of the energy used to make new paper.